As my readers know, I’ve develop an interest in beauty products from East Asia, particularly from South Korea. The South Korean government has done a great job of marketing their exports and boosted the popularity of Korean beauty worldwide. Now, of course, I also drink a lot of tea, much of which comes from Asia, but until recently, I’ve never really looked into Korean teas. I tend to buy my green teas from Japan, my oolong from Taiwan, and my black teas from either China or India. Where does Korea fit in? 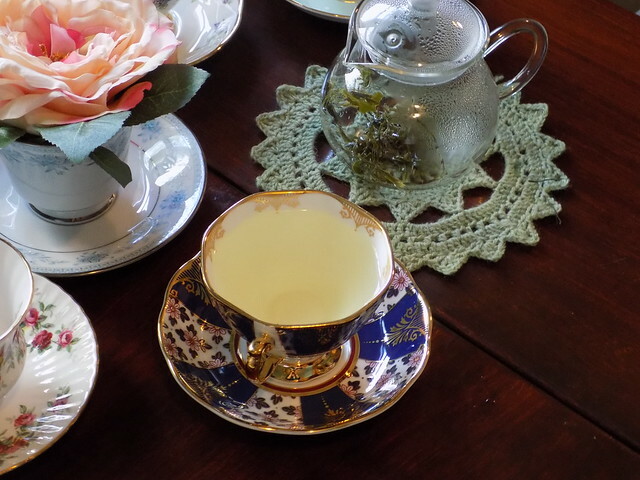 It turns out that Korea has an interesting tea-growing history. The apocryphal tale is that the Indian princess Heo Hwang-ok brought tea with her when she married the ruler of a kingdom in southeastern Korea in the first century BCE. Tea cultivation became more widespread as Buddhism took hold in Korea and was associated with that practice until the secularization of the Joseon Era. However, tea-drinking entered a decline, until a well-documented comment from a Joseon-Era king who, when presented with a way of making money by selling high-quality Korean tea, said “We do not have a tea-drinking custom in our country.” But there are still tea plantations in Korea, notably on Jeju Island, home of several skin care companies who tout green tea in their products. Wooree Tea started when the founders visited Korea as part of their charity work with orphans there. They tried some of the local tea and were so impressed by it that they decided to start a company, based in their native Auckland, NZ, selling luxury Korean teas, with a portion of the profits going to help orphans in Korea. They claim their tea has a softer and sweeter taste than Chinese tea. They claim their matcha, in contrast to Japanese matcha, is grown under natural shade from trees and mountains and tends to be grown more organically, which can translate into a softer flavor. It’s worth noting here that calling this Korean-grown powdered tea matcha may leave a bad taste in some people’s mouths, as true matcha must be made from tea leaves that are grown in deliberate shade for twenty days, which it sounds like this has not. I, however, put these prejudices aside to taste the tea. The company had a special sample offer, where they were offering a 10g sample of their Imperial Blend green tea for NZ$0.01, plus the cost of shipping (NZ$2.50). They had an additional option to include a 10g sample of their Korean matcha for an additional NZ$6.99. So for NZ$9.50, I ordered samples of both the full-leaf green tea and the powdered tea. Do note that these are in New Zealand dollars: I found the exchange rate favorable and got away under US$7 for the whole thing. Also, despite the fact that the company stresses that they are selling a luxury product for a high price, I did not find the prices of Wooree’s teas to be exorbitant. Should I wish to repurchase the Imperial Blend green tea, it will run NZ$16 (just over US$11) for 40g in a tin or NZ$19 (just over US$13) for 80g without a tin. Compared to other tea companies I’ve ordered from, this is not even on the high end of the price range. The matcha is NZ$20 (about US$14) for 40g, which is honestly on the low end of what I’ve found for ceremonial-grade matcha (of course, this cannot be called ceremonial grade) and about on par with standard-grade matcha. Alright, so now onto the tea. I ordered on April 10th and got a shipment notification the next day. It had shipped from Korea, so I didn’t expect it any time soon, but received my package on April 15th, which is pretty quick, I have to say. I immediately broke into my package to look at what I’d gotten and brew myself a cup. 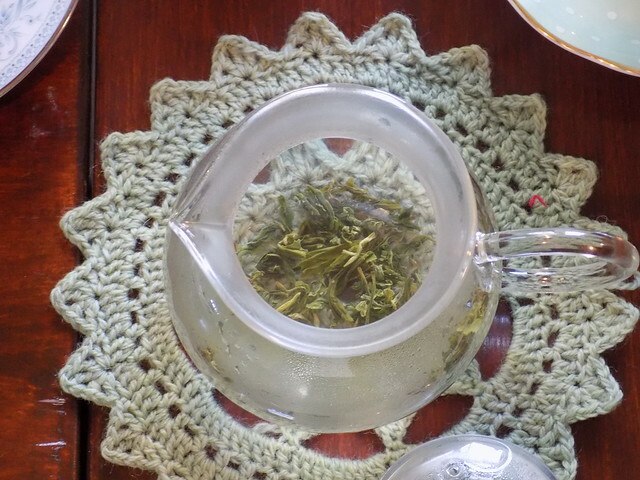 This tea is very much a green tea in the Chinese style, although I find the leaves a bit smaller and more delicate than typical Chinese green tea. I will admit, I wasn’t expecting much, as I don’t typically enjoy the seaweedy, vegetal-earthy flavor of Chinese green teas. But I wanted to give it full consideration. First, I brewed it according to their brewing instructions: boil a kettle, let it cool for 3 minutes (I did this in my electric kettle with the lid open), and then steep one teaspoon of leaf in a cup of water for three minutes. This produced a very light, but enjoyable cup of tea. The first thing I noticed was that the tea was very fragrant. It smelled about like a cup of Chinese green tea, but with more subtlety. The flavor was similar, although I will say it had more flavor than the pale, almost straw-color brew suggested it would have. I got a few infusions out of it with this method. Next, I tried it in gaiwan, which meant the same amount of leaf in less water. I also used my kettle’s temperature control setting and brewed it at 180 F instead of boiling and cooling. I steeped for the three minutes for the first infusion, then a minute and a half the second infusion, and then a third infusion for three minutes. This method brought the flavors forward and intensified them, but still avoided both the off flavors that I dislike in Chinese green tea and also the tendency of Chinese green tea to upset my stomach. Finally, I brewed it with my standard office brewing tools. I used my fish-lid travel gongfu set to brew with water from our hot water tap at work for three minutes, two minutes, and three minutes. Once again, it yielded an enjoyable result with none of the off flavors I get from Chinese green tea. All in all, I would call this tea a great one and I’ve thoroughly enjoyed tasting it. I will probably reorder it soon, probably in the 80g size so that I can split it between two tins: one for home and one for work. Update: I have indeed repurchased this tea in the 80g size, which arrived as two sealed 40g packages. I now find it my favorite daily green tea, and I generally drink it grandpa-style. As I mentioned before, it’s odd to consider this “luxury matcha,” as it is not shade-grown in accordance with the highest standards of Japanese matcha, and it is not sold at a high price. 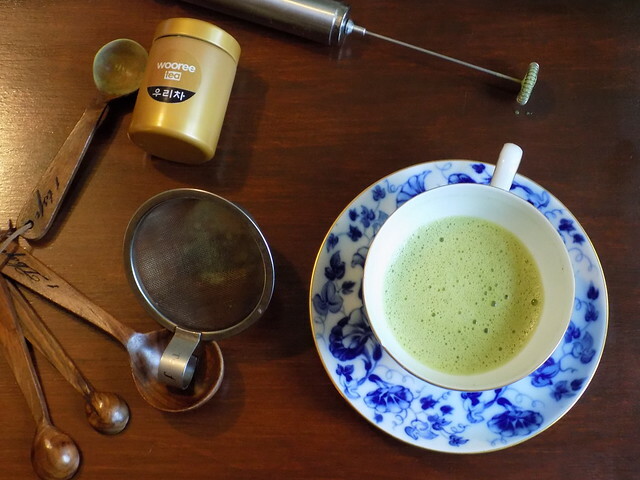 Indeed, the main photo on the Wooree website of this matcha is that of a matcha latte, which is not where you would use a high-quality matcha powder, both for economic reasons and because the subtleties of a high-grade matcha would be lost in the flavor of the milk. But the fact that it’s not terribly expensive allows me to overlook this and just taste tea. Now, I’ve drunk matcha in the past, but I’ve come to the realization that what I had was not very high grade. Also, I lack real matcha preparation tools. So I took my Korean matcha and saw how it behaved with a hobbyist’s toolset. I sifted a teaspoon into a tea cup with a tea strainer, and then added two ounces of 176 F water and mixed it with my electric milk frother. And oh my. It was a lovely cup of matcha. It was smooth and while it had an intense green tea flavor and bitterness, it was never unpleasant. Indeed, the smoothness almost gave it the creamy, soft flavor of a matcha latte, but without the milk or sugar. It also frothed up nicely with a stable crema using the electric whisk, and I found no grit or sediment after I finished my cup. The second time I tried it, I tried skipping the sifting and found it was still an enjoyable cup, but there was a bit more sediment, so I will continue to sift it in the future. I do not know if I will repurchase the matcha, as I have more matcha coming from a Japanese company soon, but I am curious how the Korean matcha compares to high-grade Japanese matcha, particularly when I get my proper matcha tools. I would definitely call this a successful experiment. Plus, I love the happy buzz I get with matcha as compared to other sorts of tea. I would certainly recommend that anyone interested in expanding their green tea horizons. NB: I was not provided any special discount in exchange for this review. Although I was approached by Wooree about their ongoing sample offer on Instagram, the sample offer is open to the public at large. All thoughts are my own. More information about sponsorship here.